Hospitals, schools, kindergartens and gas – Assad’s latest war crimes remain unanswered. During the last days, Syrian dictator Bashar al-Assad and his Iranian/Hezbollah/Russian-supported regime army proved once again that it hasn’t reached its peak in inhuman and war-criminal behavior yet so far, but works hard to reach that goal. Since last weeks fall of Busra al Sham in southern Daraa province and Idlib city in the alike-name province, the regime further perfected its terrorism against the civilian population, mainly targeting hospitals and schools in the liberated areas as well as using gas-attached barrel bombs on a daily basis. Clear evidence from southern Syria shows that schools and kindergartens under the control of the Syrian opposition become a deliberate target for the regime air force while they were more or less indiscriminately hit so far (Evidence 1 from Damascus, 2 from Kwdana and 3 from Busra al Sham). Especially the hit school in Kwdana, which was hit by a missile, fired from a regime jet, is worth a mention, as it is located exactly 693 meters(!) from the ceasefire line “Bravo”, agreed on after the Yom Kippur war (picture). Neither Israel nor the UN transmitted a complaint or stopped the Assad air force from bombing civilian targets that close to the buffer zone. 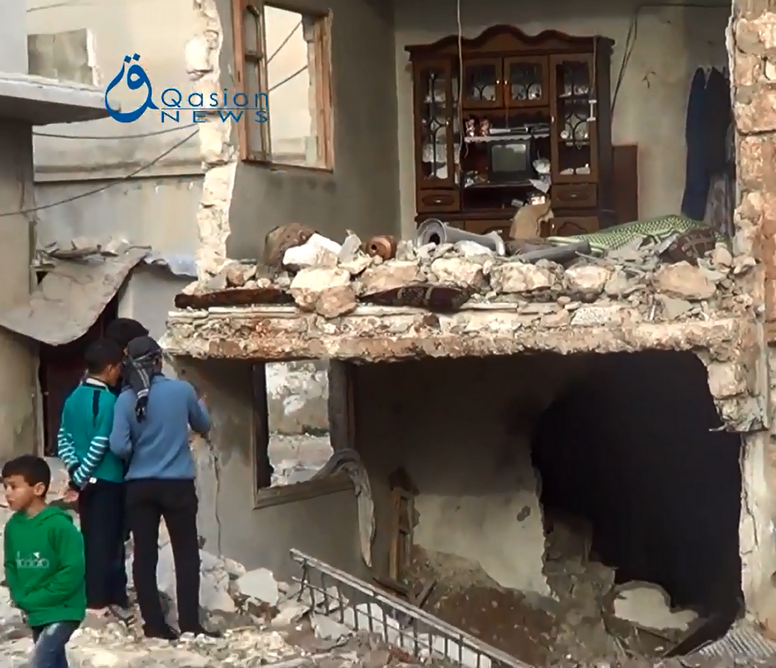 Meanwhile in Idlib city, which fell recently under a coalition of several moderate to extremist rebel groups, the Assad regime started a bombing campaign on the civilian infrastructure after losing the important town. 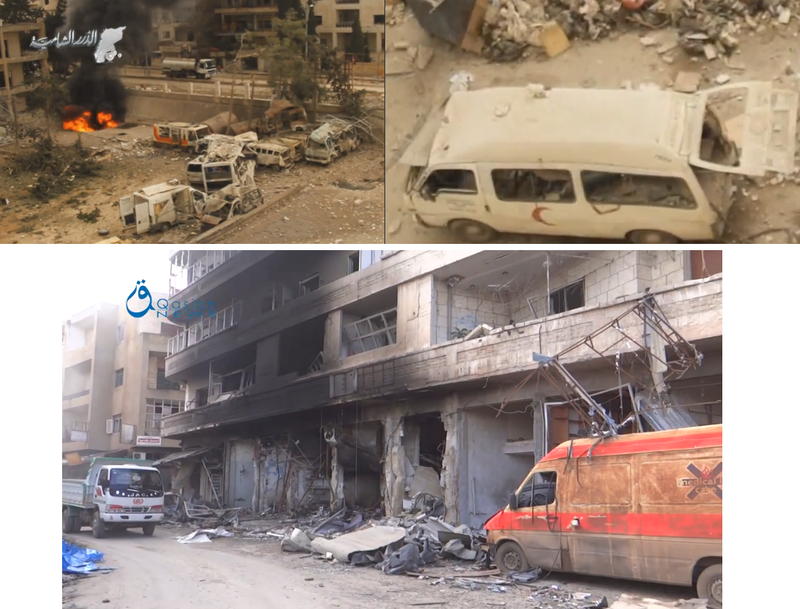 While this is seen in all regime-lost cities, the regime decided this time to use an extraordinary sinister tactic of first destroying all hospitals in the city, parallel and before starting to raid more residential areas. In this context, the city’s main “National Hospital” as well as the headquarters of the Syrian Red Cross ( resp. Red Crescent were hit in coordinated strikes on March 30. At the same time, the Assad regime bombs quarters across the city, using jet-fired missiles, helicopter-dropped barrel bombs as well as surface-to-surface missiles, trying to achieve maximum casualties among the civilian population. Many of his barrel bombs are equipped with Chlorine gas canisters to increase the terror for the hit people. Hence, the occurrence of (gas) bombing victims of all religions becomes an increasingly common appearance in the now-free, but hard-hit city (see pictures below). Last but not least, its must be said that the international reaction to all these WAR CRIMES is zero, talking about other Arab states, being involved in the Yemen campaign as well as Europe and the United States, being busy with reaching a deal with Assad’s main sponsor Iran. These nuclear negotiations seem to give the “Butcher of Syria” a free ticket to continue his reign and atrocities on a daily basis. But not only he benefits from the international blind eye. Also the “Islamic State” terror group and its sympathisers in European countries profit from the inaction, as it is fueling their narrative of an “idle (or even “supportive”) West while muslims are slaughtered”. In the end, this development will not only lead to more sorrow among the Syrian civilian population (and thus more refugees abroad), but could also fuel anti-Western tendencies among muslims in Europe and thus increase the chance of more IS-related terror attacks like we saw them in Paris and Copenhagen. 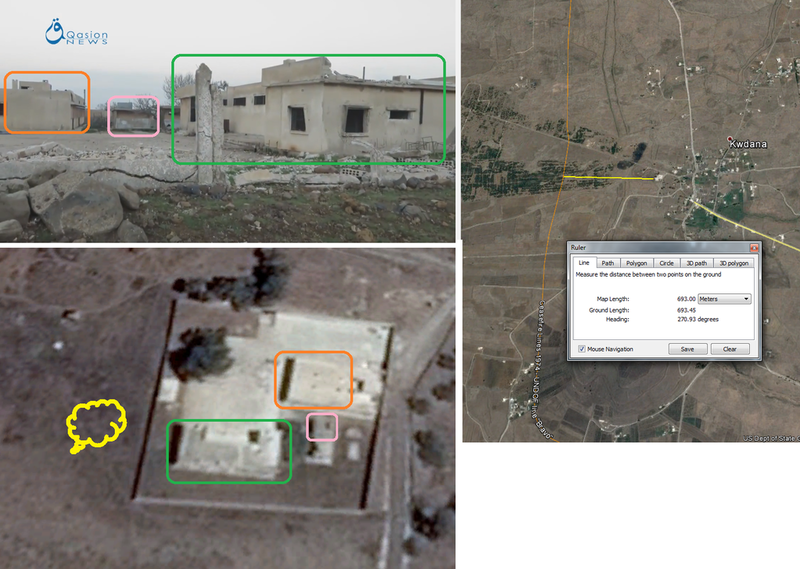 This entry was posted in Syria and tagged Assad WarCrimes, gas, hospitals, NFZ, schools, Syria by Julian Röpcke. Bookmark the permalink. Dude this is nothing.Imagine if they load up an Il-76T transport(40 tons of load) with “barrel bombs” and then carpet bomb the whole city World War 2 style.This is still only random bombings with small number of planes involved.During the Sudanese conflict the Sudanese air used the tactic mentioned above.